European Senior Chess Championship 2018 took place from 3rd-13th August in Drammen, Norway. 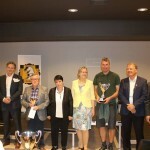 The Championship was played in 9 rounds, Swiss system, with time control 90 minutes for 40 moves plus 30 minutes for the rest of the game with an increment of 30 seconds per move, starting from move one, with the total prize fund of the event of 10.000 EUR and top players of each category were awarded with cups and medals. 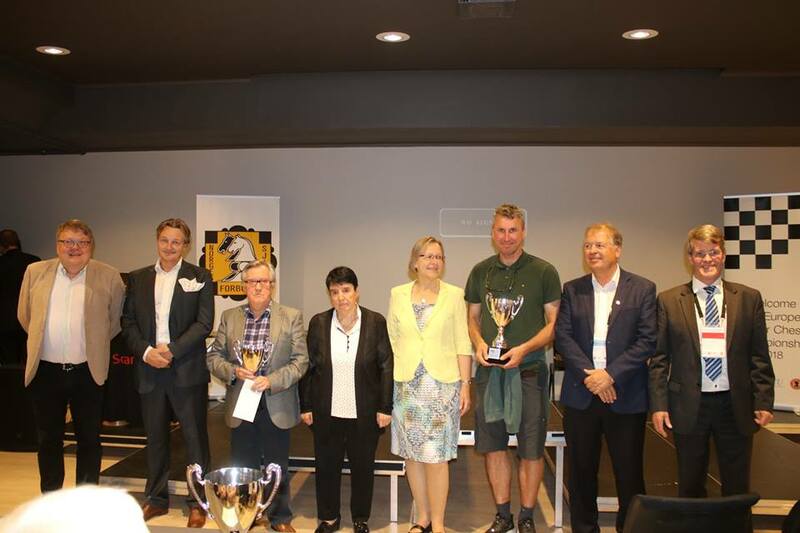 After 9 played rounds the title of European Senior Chess Champion for category 50+ went to GM Simen Adgestein (NOR, 2576) who became the sole winner of the event with score of 8 points. The second place went to Conny Holst (SWE, 2147) with 7.5 points, while Peter M Gayson (ENG, 2150), Luc Zimmermann (NED, 2184), IM Sandor Biro (ROU, 2193) and Thore Nyboe Jensen (DEN, 2083) tied for the third place, each with 6 points, but thanks to the best tiebreaks Peter M Gayson finished the event with bronze medal. In women’s section 50+ the first place came to WIM Brigitte Burchardt with 6.5 points who maintained the sole leadership until the end of the event. WFM Olga Birkohlz (GER, 2048) took silver medal with 5.5 points and WFM Sylvia Johnsen (NOR, 1977) took bronze thanks to the better tiebreaks than WIM Annet Wagner-Michel (GER, 2120) and WGM Svetlana Mednikova (RUS, 2110) who reached the same score of 5 points. In section 65+ the top trio was determined by tiebreaks since GM Vladislav Vorotnikov (RUS, 2445), Askell O Karason (ISL, 2217), IM Nils-Gustaf Renman (SWE, 2348) and Hans Werner Ackermann (GER, 2246) tied for the first place, each with 6.5 points. Eventually according to the tiebreak criteria, Vladislav Vorotnikov took gold, Askell O Karason was second and Nils-Gustaf Renman ended third, while Hans Werner Ackermann finished the event on the 4th place. The best women player of section 65+ was Nona Gaprindashvili (GEO, 2305) who was crowned as European Senior Women Chess Champion 2018. The second place went to WGM Elena Fatalibekova (RUS, 2181) who reached the same score as Nona Gaprindashvili- 5.5 points, but according to the tiebreaks, she took the silver medal. Third place went to WGM Tamar Khmiadashvili (GEO, 1969) who reached 5 points.